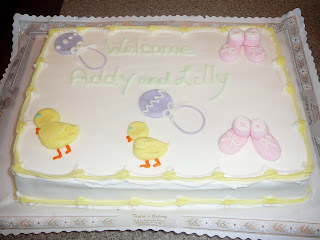 Addy & Lilly--A Whole New World! : Shower Weekend! Here are some of the girls who made it in for the shower (R-L, back row, then front): Gretchen, Stephanie, Me, Jenny, Michelle, Erin, Kristina & Becky I have spent the day recovering from yesterday, the shower was so much fun. It was an amazing combination of people. 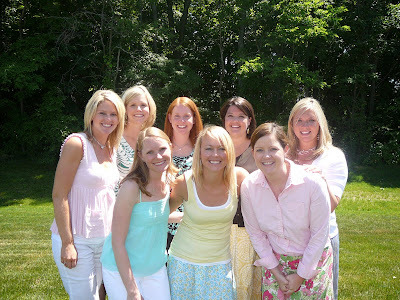 Girlfriends from high school, college & graduate school, girlfriends of Jeremy's, mothers of some of Jeremy's closest friends, women I have worked with and family. Some people traveled from as far as Tennesee (Stephanie) & North Carolina (Jenny). It was obvious that these little babies have a lot of people awaiting their debut into the world! Thanks to Michelle for hosting and all who helped, attended or who couldn't attend and sent well-wishes! We are now going into our 25th week and I'm feeling pretty good. Me and my entourage (Jeremy and the soon-to-be Grandmas) all went to the doctor on Friday and we graduated from the specialist! He said that if my pregnancy continues on this road there is no reason for me to be seen by him and so he passed me back to my normal OB. He called me "boring" and to us at this stage in our pregnancy, boring is very good! The babies each weigh 1 pound, 9 ounces each and were both very active during the ultrasound. Jeremy and I started our Childbirth Preparation classes last week, we have 3 more to attend and they make for some good mid-week entertainment, so I'll write about them later this week. Happy Shower!! And happy 25 weeks & "graduation"!